Since the earliest settlers into the Schaumburg (Sarah's Grove) area, St. Peter Lutheran Church and School has been present. In the early 1830's, German settlers came into the area which is now known as Schaumburg, Illinois. These settlers worked together to build a better life in America. 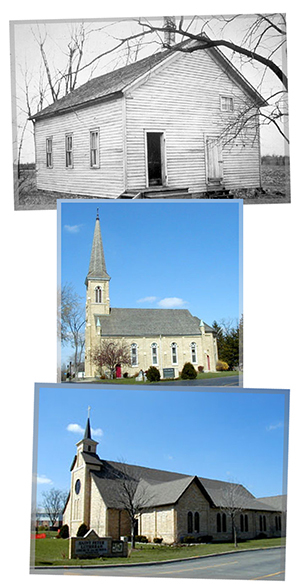 Together, they formally formed St. Peter Lutheran Church and School in 1847. These first settlers brought their Lutheran faith. They instilled their Lutheran beliefs and morals into the roots of the community. As the church and school grows and continues to teach the Gospel, the sense of family is felt all around. St. Peter Lutheran Church and School played a large role in building Schaumburg up. St. Peter also assisted in the development of the Lutheran Church Missouri Synod. Through the years, new buildings have been built, Pastors and congregational members have come and gone but one thing has remained...the Gospel. You may inquire with our church office to visit the Historic Museum and Cemetery. See the link to the left for more details on how St. Peter played a role in the community we call home, Schaumburg!